We are pleased to announce the five new Creo Design Packages, redefining what your 3D CAD software should include. Creo Design Essentials, our entry-level package, is resetting the bar with more capabilities in every seat. Subscribe today to get all of these new benefits, right out-of-the-box. Welcome to the new industry standard. Learn how to take advantage of a special offer to upgrade. There's even more when you subscribe to Creo — keep reading! Visually communicate your stunning products for design reviews, marketing collateral, packaging, and more with photorealistic rendering with Creo Render Studio, powered by Luxion's Keyshot. 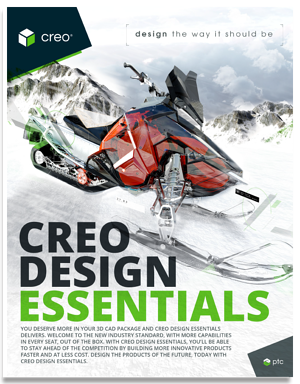 Creo Design Essentials is the new standard in what you are entitled to in a 3D CAD software bundle, with the definitive combination of affordability, flexibility, and power. 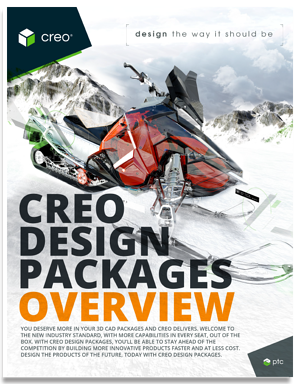 In the event that you need even more than that, there are additional Creo Design Packages that you can take advantage of. Own a perpetual license of Creo? We are extending a special, limited-time discount allowing you to upgrade your existing, perpetual Creo packages into the new industry standard in 3D CAD. With the introduction of the Creo Design Packages, there has never been a better time to join the community of Creo users. Contact us for more information. You made a great investment. You may qualify for a free upgrade to the comparable Creo Design Package.¹ That's our shared commitment to your success. Contact us to enter the new standard in 3D CAD. ¹: Offer is available exclusively through participating PTC resellers only. Offer valid worldwide for all companies with a qualifying PTC Creo or Pro/ENGINEER products. This offer is not valid for educational or academic licenses. Offer begins October 2, 2018 and expires December 28, 2018 at 11:59PM EST. This offer cannot be combined with any other discount or offer. PTC reserves the right to cancel, suspend, or modify part of or an entire promotion at any time without notice, for any reason in its sole discretion. Prices for PTC Software are subject to change and may vary per country. Offer(s) subject to reseller participation. PTC resellers are independent and free to set their own prices and may participate in promotions at their discretion. Reseller prices may vary. Other restrictions may apply. Contact PTC or your local participating PTC reseller for further details.